I'm sick for the third time this year! :( Therefore, I don't have any posts for this week. I hope to be back with a post the Monday after Easter, so be sure to check back! 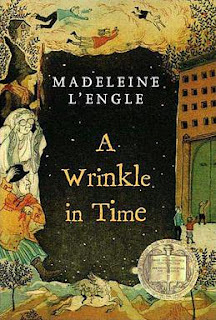 Just after its new movie adaptation has been released, I am recommending A Wrinkle in Time by Madeleine L'Engle for MMGM (and including a bonus movie review below!). A Wrinkle in Time revolves around a young girl named Meg Murry, whose father, a scientist, vanished several years before the book's events. When her younger brother, Charles Wallace, befriends three strange women (who turn out to be magic), both of the kids, along with a kind classmate from Meg's school named Calvin, end up going on a quest across the universe to find their father. I loved this book when I read it as a young kid (I was only about 5 or 6), and I still love it now! One of the best parts of the novel is how it is not like other fantasy or sci-fi books. Instead of filling the book with tons of background information about the universe and its workings, L'Engle instead gives just enough information to understand how the characters are traveling across the universe (or "tessering") and what exactly they are fighting against (although a main point of the book is that the human brain is simply incapable of fully understanding the universe). Despite keeping the book simple enough for readers to understand, L'Engle still creates imaginative settings of unique, beautiful planets (and one dystopian one where everyone has to act exactly the same, fill out forms for nearly every event in their lives, and face vague yet disturbing punishments). Another great part of the book is Meg's development throughout the story. Toward the beginning of the story (and during most of the middle), she often gets irritated and impatient, annoying those around her, but she does desperately want to locate her father. As the book goes on, however, Meg becomes more brave and is able to use her intelligence to fight against the book's main villain, IT, in an ingenious way. A Wrinkle in Time is simple enough for young children to understand, yet complex enough to hold the attention of older kids or adults and become a favorite book of theirs! Bonus movie review: As soon as I saw the preview for the new movie adaptation of A Wrinkle in Time, I was thrilled! In sixth grade, I had to read the novel yet again and see the awful 2003 movie version, which was made for TV and featured horrendous acting, cheesy effects, and scenes that detracted from the original point of the book (and had sets so ugly that I couldn't even focus on the action!). I worried a little after seeing the very mixed reviews of the new movie (it has a very low score on Rotten Tomatoes), but, after seeing it, I think anyone who has read the book will love the new movie! The new movie is not completely the same as the book: the formerly all-white characters have been changed to include a mixture of races (which I'm all for! ), irrelevant characters such as Meg's siblings Sandy and Dennys have been erased, and several new scenes have been added. However, as I watched the movie, I wished that the new scenes had been in the book, as they helped to highlight some of the book's main themes (such as Meg's growing maturity) even better! The movie has fantastic actors: Storm Reid, who plays Meg, does a great job of showing her emotions, struggles, and personality during the movie. The three magic women who guide Meg and her companions, Mrs. Which, Mrs. Who, and Mrs. Whatsit (played by famous actresses Oprah Winfrey, Mindy Kaling, and Reese Witherspoon, respectively) are depicted fabulously, with their unique outfits and great lines (sometimes wise, sometimes funny) helping to show their magic and magnificence even more than in the book! Finally, the new movie has great special effects that take exactly what readers imagine the book to be like and make it even better! As I saw the new film, I was practically glued to my seat, as any viewer will be if they take my advice: ignore the bad reviews, and go see this movie NOW! 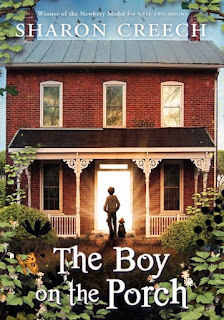 For MMGM, I am recommending The Boy on the Porch by Sharon Creech. I am a fan of several other books by Sharon Creech, and this novel did not disappoint! The "parents" in the story, John and Marta, do not have kids, so they are caught completely off guard when they find Jacob on their porch and take him in. The novel is told from Marta and John's points of view as they find themselves opening up and feeling worry about Jacob, pride in him, and a need to provide for him and give him a good home, even if that means trying to find his parents. The couple's kindheartedness and depth make them great characters for the story to be told through. The boy, Jacob, quickly adapts to his new home and, despite refusing to speak at all during the story, displays his feelings through his activities (such as playing with animals, drawing, or making music), allowing us to see, albeit blurrily, into his past and current lives. Creech describes each scene so perfectly that it feels like you are actually looking down into a new world. Toward the end of the book, seeing all of the new kids that John and Marta begin fostering acts as a perfect closing to the story. 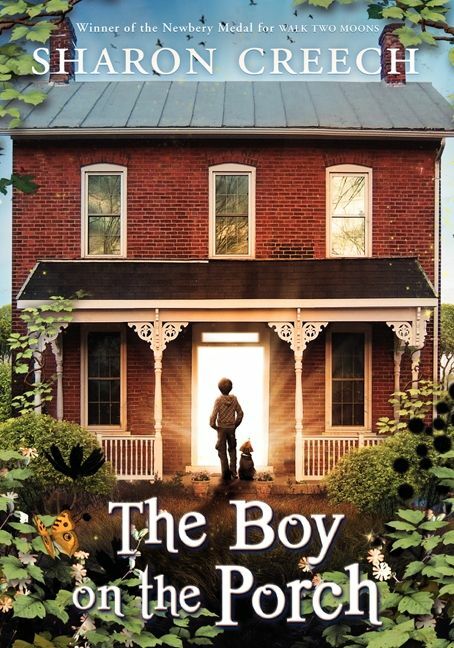 All in all, The Boy on the Porch is a lovely novel that provides a peek into the lives of both parents and children! 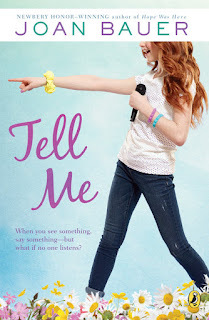 For MMGM, I am recommending Tell Me by Joan Bauer. Told with Joan Bauer’s trademark mixture of humor and heart, Tell Me will enthrall her many fans and win her new ones. This is an absolutely fantastic book! I haven't meant to, but my last several recommendations have all intended to broaden one's understanding of people's situations, and this book is no different. The main conflict of the novel is Anna's finding of a girl who seems to have been imprisoned, in a way, by several people. As Anna shares the information she has found with the police and government, she helps to uncover a conspiracy of human trafficking and save those who were being trafficked. This book showed me, as it will other readers, how common human trafficking can be and how paying attention can save many people. This main plot point does not make the book overly upsetting, however, as the novel is filled with all sorts of fun characters (Anna meets several students who are in their school's band and befriends a teenage girl named Taylor and her horse, Zoe) and is set in a wonderful small town filled with personality and unique traditions. Finally, the struggles of Anna's parents as her father tries to deal with his anger issues are depicted very well. Anna's father is shown to care about Anna and his wife and to simply have flaws, however major, that he is working to control. All in all, Tell Me is a great novel that packages great writing and many unique situations into one book that anyone will enjoy!